Cheese lovers rejoice! This homemade Instant Pot White Cheddar Jack Mac N Cheese is made with real cheeses and made in a matter of minutes! This recipe is made using the Instant Pot. Every chance I get to use my Instant Pot, I go for it. Even if it’s something as simple as homemade mac n cheese! By the time the Instant Pot has come to pressure and starts cooking, I have already chopped up my cheeses and I’m ready to finish making the dish. Since it takes very little time to make, it doesn’t take a lot of effort and I can focus creating my main dish for dinner. After the daunting task of creating a meal every night… I’ll take all the help I can get! This recipe calls for white cheddar cheese and Monterrey Jack cheeses. It’s easy to grab a bag of shredded cheeses to make this dish but it won’t melt as well and it won’t come out as creamy. When buying shredded cheese, it has added starches in the package, meaning it prevents the cheese from melting as well. In this Instant Pot White Cheddar Jack Mac N Cheese recipe, I used New York Extra Sharp White Cheddar Cheese but you can use the Sharp White Cheddar if you choose. It’s really a taste preference and it’ll be good either way! 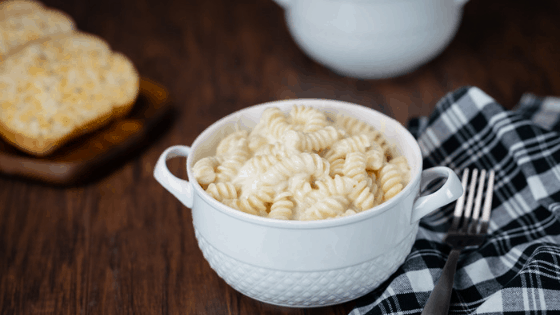 In this Instant Pot White Cheddar Jack Mac n Cheese recipe, I used fusilli pasta. I absolutely love the texture and flavor of this pasta! If you can’t find it, you can substitute it for rotini or even elbow noodles if you’d like. When making this pasta in the Instant Pot, it’s important to make sure that the pasta is covered with water so you may need to increase the amount of water than what is in the recipe. There is water left over in the pot after it is done cooking – don’t fret, leave it in the pot (as long as it’s just a small amount, you can drain some of the water if you feel the need to) and continue on with adding the remaining ingredients. White Cheddar and Monterrey Jack Mac N Cheese made in the Instant Pot and made with real cheeses. Place the pasta in the Instant Pot and add the butter, water, ground mustard, pepper, and salt. Close the Instant Pot and set on manual for 4 minutes. While the Instant Pot is coming to pressure, prepare your cheeses by chopping them into pieces. Once the timer has gone off, quick release your Instant Pot. If the vent gets foamy, close the vent, wait a couple of seconds, and then repeat the process until all pressure is released. Remove lid, stir, add in chopped cheeses and cream cheese. Lastly, add in the milk, a little at a time until you have reached your desired creaminess.